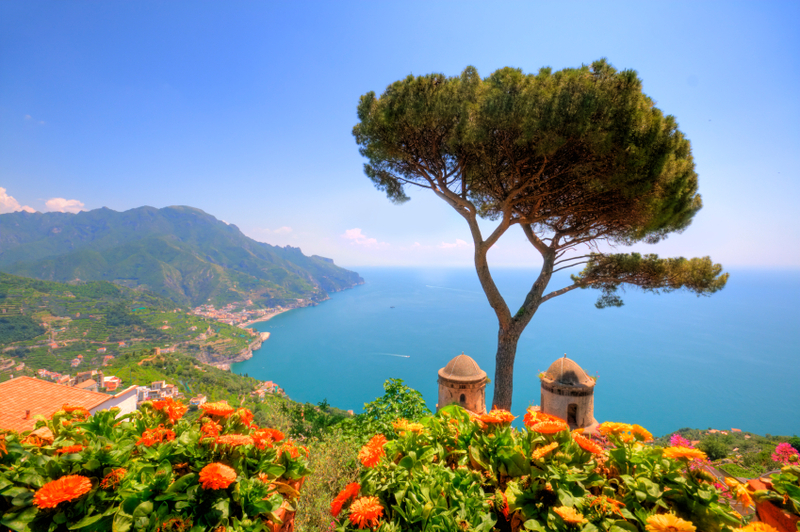 Ravello is a terrace on the Amalfi Coast. A path that enables you to admire the different influences, which for centuries have shaped its architecture, can only start from Santa Maria a Gradillo. You will find yourself Immediately immersed in the true heart of the city : Piazza Del Vescovado which overlooks the Cathedral and the tower at the entrance of the enchanting Villa Rufolo. The square is a choreographic set of buildings originating from the thirteenth and fourteenth centuries, immersed in a lush and varied vegetation. Going up through the shady streets a pleasant walk links the square to Villa Cimbrone the interiors of which are well worth a visit . Along Viale Dell’Immensità you will immediately come to the lookout point par excellence overlooking the sea, the famous Terrazza dell’Infinito. By moving towards the northern edge of the town you can reach Piazza Fontana, from which a narrow street leads up the hill of Brusara. Finally a delightful short and incredibly rewarding downhill walk allows you to reach Minori, among ancient steps and narrow streets, surrounded by the intense scent of the maquis. The route offers wonderful views of the coast and the sea.